By all accounts, the meeting was a tremendous success and participants spoke highly about the scientific discussions that took place. We have made available a brief narrative about the meeting, as well as photos and audio interviews. 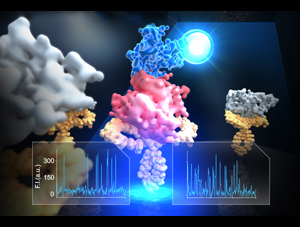 We asked participants about their research, and their views on Frontiers in Membrane Protein Structural Dynamics 2014, what they felt were some of the highlights of the meeting, and if applicable, their recent collaborations with the MPSDC. 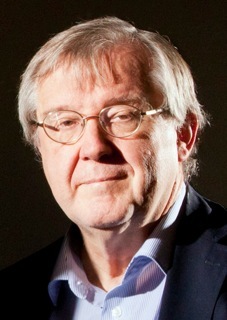 In the interview, Dr. Schulten addresses his scientific research interests both past and present, his perspective on some of the key challenges for the field of membrane protein biophysics in the coming 5-10 years, his keynote lecture, and the Membrane Protein Structural Dynamics Consortium. As previously announced, Anatrace has graciously sponsored travel awards and poster prizes for students and postdocs attending the meeting. Four travel awards ($500) and two poster prizes were decided by a panel on the basis of merit. Winners of these awards were announced at the meeting, and can now be released to the public. 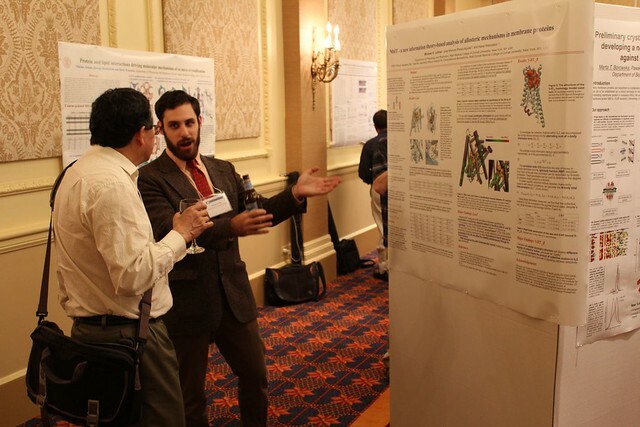 As in previous years, the MPSDC sponsored several satellite events in Chicago area prior to Frontiers in Membrane Protein Structural Dynamics 2014. This year, the Computational Modeling Core hosted a membrane protein modeling workshop and a mini-symposium concerning the latest advances in computational approaches to the study of membrane proteins. The modeling workshop provided attendants with an overview of the use of the modeling dynamics and visualization software NAMD and VMD, the CHARMM-GUI Ligand Binder module, and force field parameterization tools. Workshop speakers included Emad Tajkhorshid (UIUC), Wonpil Im (University of Kansas), and Jeff Klauda (University of Maryland). The lecture notes for this workshop are available on our website. 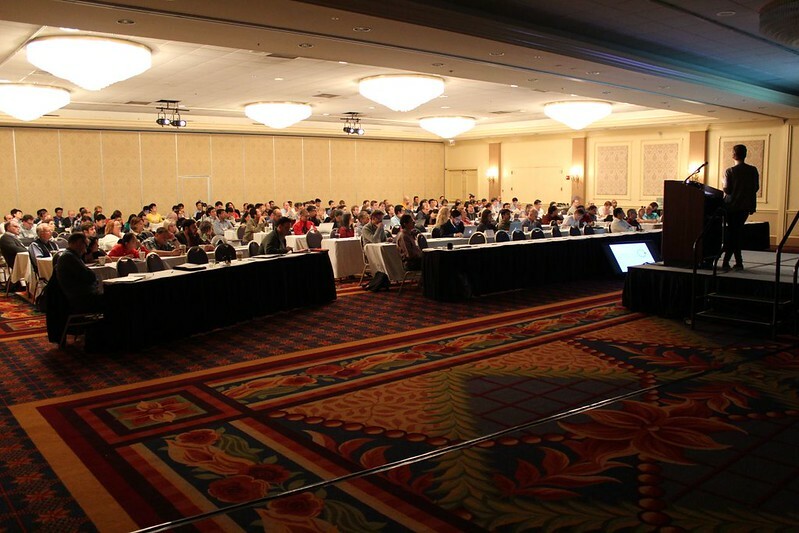 This year’s Computational mini-symposium covered a number of topics including methodologies and their applications, voltage gating, and pumps and transporters. This year, the Consortium also held its first workshop on Spectroscopy. This workshop was oriented towards young investigators who wish to learn techniques needed for real time monitoring. Talks addressed techniques in solid-state and solution NMR, EPR including DEER approaches, infrared, fluorescence and single molecule techniques including magnetic tweezers. Speakers included Yeon-Kyun Shin (Iowa State), Ana Correa (University of Chicago), Tae-Young Yoon (KAIST), Martin Zanni (University of Wisconsin), Marc Baldus (Utrecht University), Gary Lorigan (Miami University), and Danielle Goldfarb (Weizmann Institute). Both workshops and minisymposium were well attended and productive, and as before, we will continue to host such satellite events in the future. The MPSDC Computational Modeling Core has recently supported the development of two new webservers, which are made available for usage by the broader scientific community. Biomolecular conformational transitions are essential to biological functions. Most experimental methods report on the long-lived functional states of biomolecules, but information about the transition pathways between these stable states is generally scarce. Such transitions involve short-lived conformational states that are difficult to detect experimentally. For this reason, computational methods are needed to produce plausible hypothetical transition pathways that can then be probed experimentally. Here we propose a simple and computationally efficient method, called ANMPathway, for constructing a physically reasonable pathway between two endpoints of a conformational transition. We adopt a coarse-grained representation of the protein and construct a two-state potential by combining two elastic network models (ENMs) representative of the experimental structures resolved for the endpoints. ANMPathway determines the most probable (lowest energy) transition pathway between two stable endpoints of a conformational transition. Conceptually, ANMPathway represents a direct application of the string method to a two-state CG system approximated by ANM energy surfaces. The result is a sequence of PDB structure (a “string”) smoothly linking the two endpoints. This webserver was developed by Avisek Das and Sunhwan Jo from Benoit Roux’s group at the University of Chicago, with support from the MPSDC. This webserver was developed by Aashish Adhikari from Tobin Sosnick’s group at the University of Chicago, with support from the MPSDC. Tajkhorshid, together with postdoctoral researcher Mahmoud Moradi, recently published a paper on conformational transitions of ATP exporters which was recommended on the F1000Prime or "Faculty of 1000" website. F1000 is a team of 5,000 Faculty Members – senior scientists and leading experts in all areas of biology and medicine — plus their associates who provide recommendations of important scientific articles, rating them and providing short explanations for their selections. Mahmoud Moradi and Emad Tajkhorshid. Photo taken from the University of Illinois News Bureau website. Photo by L. Brian Stauffer. The Conformational Dynamics in the CLC Channel/Transporter Family Project of the Membrane Protein Structural Dynamics Consortium (MPSDC) has published its first publication titled “Water access points and hydration pathways in CLC H+/Cl- transporters” in Proceedings of the National Academy of Sciences of the United States of America (PNAS). This Consortium Project is spearheaded by Principal Investigator Merritt Maduke. The laboratories of Marc Baldus, Emad Tajkhorshid, and Hassane Mchaourab are also collaborators in the Project’s ongoing research. 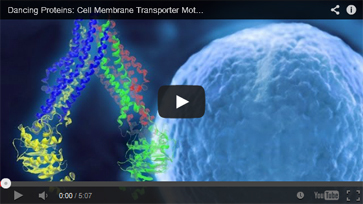 CLC transporters are biologically essential proteins that catalyze the transmembrane exchange of chloride for protons. The permeation pathway for chloride through the transporters has been well characterized. In this publication, Han et al. study the more elusive permeation pathway for protons. Through computational modeling, they show that water molecules can permeate deep inside the protein and form continuous wires. To test the hypothesis that these water wires mediate proton transport, they mutated residues predicted to impede water wire formation and experimentally evaluated the effects of the mutations. The results from their concerted computational and experimental approach strongly support the role of water in proton transport by CLCs and provide a valuable framework for investigating their overall transport mechanism. Indeed, this research article reports results from the tightly coordinated efforts of a computational and an experimental lab brought together by the Consortium. The study addresses a critical question about the CLC transporter mechanism: how does H+ traverse the hydrophobic expanse of the CLC protein? The MD simulations performed reveal water dynamics, water-wire formation, and side-chain conformational change not observed in any of the static crystal structures. The functional analyses validated predictions of the simulations and confirm the importance of water dynamics in the transport mechanism. 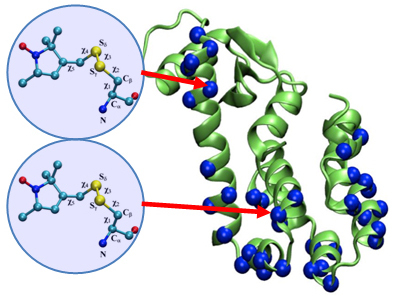 The simulations further reveal that Cl- binding is critical for water-wire formation, thus providing a satisfying explanation for the puzzling experimental observation that Cl- occupancy correlates with the ability of CLCs to transport H+. 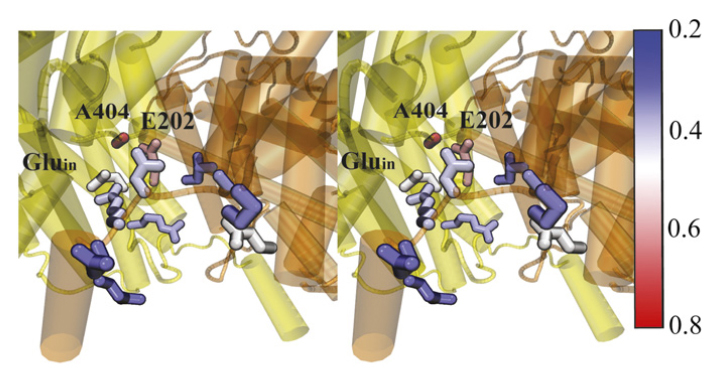 These studies provide a crucial framework for understanding how H+ and Cl- binding and translocation steps are coordinated in the CLC transporters to control stoichiometric transport. Comments? Questions? We would love to hear from you. Please share your thoughts with us. 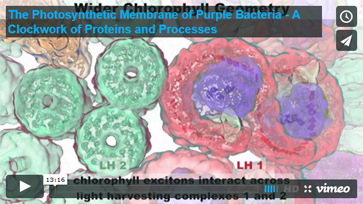 © 2014 Membrane Protein Structural Dynamics Consortium. The MPSDC is supported by NIH/NIGMS Grant No. GM087519.